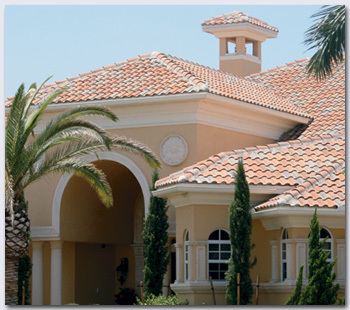 Tile Roofs | Your #1 Roofing Company in West Palm Beach, Boca Raton, Treasure Coast, Florida. Tile is a beautiful, long lasting roof with limited maintenance needs. There are many architectural styles and color choices available. Roof tiles are available in concrete and clay material. RoofPro installs tile roofs with a 2-part Polypro Foam using a large patty size to provide the maximum wind resistance as provided in High Velocity Wind Zones. According to a 2007 study from the National Association of Home Builders, concrete tile is one of only three roofing materials that will last a lifetime. The other two are clay tile and copper. RoofPro is an independent contractor for FPL and as such your new roof may qualify for a rebate. White tile is the only tile currently qualifying for a $325 FPL rebate. The rebate will be deducted from your contract price. You do not have to wait for a rebate in the mail. Tile manufacturer's offer roof tiles that are ENERGY STAR® and/or Cool Roof Rating Council approved. These products reflect sunlight and heat away from your home. You can save an estimated 10-30% on your air conditioning costs. These are a few of the tile brands that RoofPro installs. Click on the logo to view tile profiles and colors. We can accommodate any product selection as long as it's approved for use in South Florida. Click on the logo to view tile profiles and colors. We can accommodate any product selection as long as it's approved for use in South Florida.